Normally, the night before my brother does a cookery demonstration, I get a phone call. Cooking in front of three or four hundred people without knowing exactly what I was doing would scare me senseless, but he manages it, and he gets away with it. The Bingley Fine Food Festival took place over the Easter weekend, with a packed market and a programme of cookery demonstrations from people like James Martin and Robert Ramsden (aka My Brother, The Chef).The market collected together a range of suppliers from around Yorkshire – butchers, bakers, fishmongers, people selling jam, olives. It was busy and bustling, with some great produce for sale, including a sublime pork and black pudding pie, but we’d really come to see Robert’s demonstration. Rob started out at The Angel, at Hetton before moving to the Fourth Floor restaurant at Harvey Nichols in Leeds. He then took the Head Chef position at The General Tarleton near Knaresbrough. Rob then moved out of the kitchen and into the supply chain, developing the grocery business at DeliFresh, a Bradford-based commercial grocer. 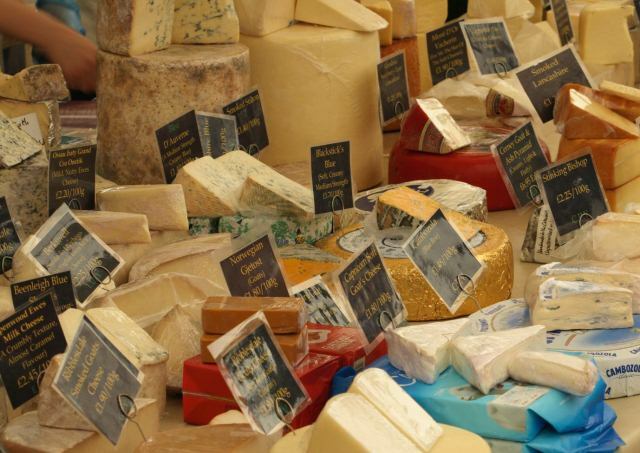 This involves sourcing new ingredients, cooking with them and selling to the region’s cooks and restaurants. DeliFresh is a grocery business on a huge scale, and it’s likely that if you eat out in the North, you’ve eaten some of their produce. The demonstrations took place in the Bingley Art’s Centre, a small regional theatre more often used for, shall we say, amateur dramatics.Rob’s demonstration was the last of the programme, to a full theatre. He started with a pan seared fillet of black halibit, just coming into season and landed at Redcar, served on a bed of confit fennel and baby watercress from a small grower South of Paris, with morrel mushrooms. Fennel is often underused and is excellent served raw in a salad. The main course was a pencil fillet of rabbit, a long, lean cut of white meat from a wild Yorkshire rabbit, shot on the Swinton Park Estate. The rabbit was wrapped in Parma ham and gently pan fried over a low heat for ten minutes or so. I thought the rabbit was a risk, because I’ve never managed to cook a rabbit dish that rose above the ‘hmm, ok’ level, but this looked superb. The lean meat was offset by the salty ham, which protected it as it cooked, crisping up, as bacon should. A classic saltimboca. 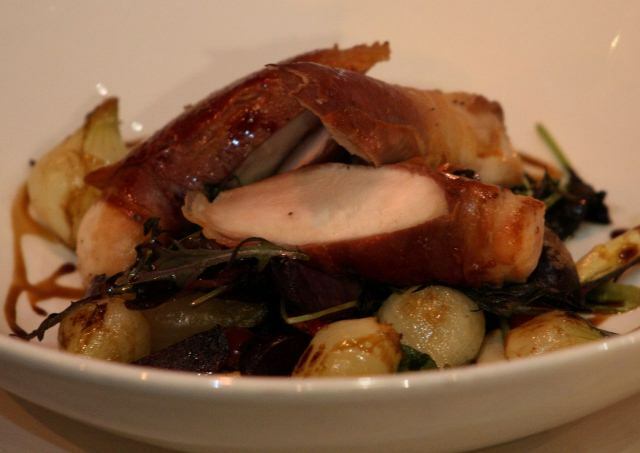 The rabbit was served on a bed of slowly confited shallots, black trompette mushrooms and boiled purple potatoes, with a wholegrain mustard and Yorkshire rapeseed oil dressing. The rabbit came with a Sicilian panzanella salad of green plum tomatoes, red onions, chicory, picchino tomatoes and basil with a red wine vinegar and rapeseed dressing. The salad was topped with some torn up buffalo mozarrela, from Langthorns in Harrogate. Yes, there is a small herd of buffalo roaming the moors of North Yorkshire. 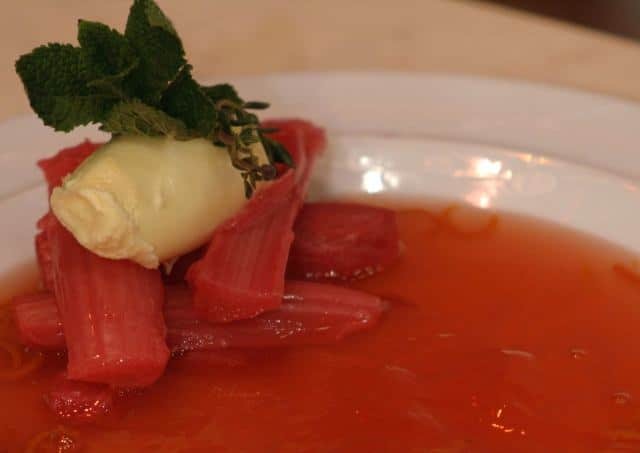 The final dish was a rhubarb and ginger beer jelly, some slowly stewed rhubarb on the side, with clotted cream. In a piece of spectacular misfortune, the theatre’s lights had caused the pre-prepared jellies to melt. Only later did we realise that the stage set included a fridge, which would have come in handy. A couple of cracks about James Martin burning his biscuits the day before, and a bit of mint garnish later and all was recovered. Well, it wasn’t actually, but nobody seemed to mind, and the puddle of jelly was exceptionally well presented. Rob’s demos are lively and entertaining. He’s a natural performer and an excellent cook, jelly aside. On Saturday, it became apparent that he’s attracted what can only be described as ‘fans’…two young ladies sat within earshot of a friend whispering about him, then asking for a photograph afterwards. You can imagine how amusing I find this. 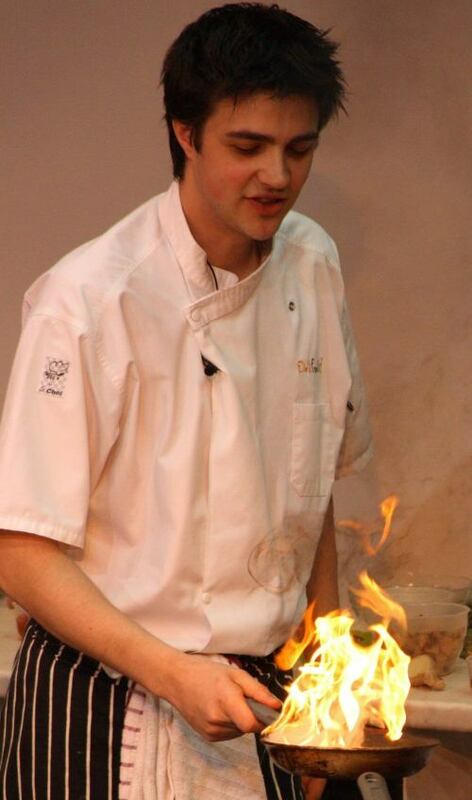 Rob cooks quite regularly at various events in Yorkshire. Catch him next at the Yorkshire show in Harrogate.